Nothing ruins an idyllic picnic or afternoon in the garden more than swarms of mosquito’s or biting insects hell-bent on turning your hard-earned relaxation time into an epic battle. Don’t let this happen to you this year – use your insect repellent essential oils and enjoy your time outdoors! Did you know, in some countries you may suffer more than just painful bites and stings; it may lead to serious or even life-threatening diseases? In areas of the U.S. for example, mosquitoes continue to infect people with West Nile virus which can cause fatal neurological diseases such as encephalitis. The Zika virus has been in the news lately and is of particular concern to pregnant mothers, since there is still no effective vaccine. 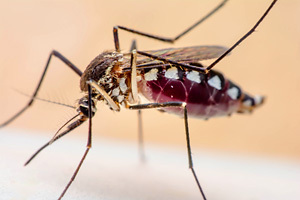 This virus is also transmitted by mosquitoes, and various agencies have issued travel warnings for pregnant women in countries where the disease is spreading. 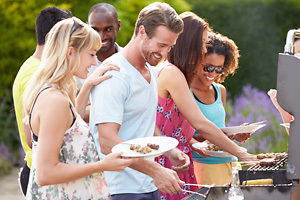 Even at a less life-threatening level, most of us find it difficult to enjoy that barbecued sausage-on-a-stick once we hear the familiar high pitched whizzing sound signalling an approaching squadron of gnats or mosquitoes. Just one mozzie checking out the inner workings of your ear is usually all it takes to make you lose all interest in the long-awaited alfresco event – despite all the tasty food and drink! But help is at hand because essential oils are of course, natures very own ‘insect repellents’. Plants produce essential oils specifically as a self defence mechanism against would-be predators. Tiny oil producing glands within the leaves evolved millions of years ago to prevent the plant from literally being eaten alive by insects, and it’s obviously been a highly effective strategy. Today we can extract these essential oils and use them to defend ourselves against the very same predators without exposing ourselves to the nasty chemicals found in some products that have unwanted side effects. Isn’t nature wonderful! You probably already have some of the insect repelling essential oils you’ll need, so here are a few tips how to use them to protect against a hostile invasion. At the first signs of these kamikaze critters, use insect repelling essential oils of catnip, citronella, eucalyptus lemon, lemongrass or thyme as your first line of tactical defence. These essential oils have all been used effectively throughout the ages to repel insects right up until the development of modern chemical deterrents. In 2002, a study by the American Mosquito Control Association discovered thyme essential oil had a 91% protection rate against female mosquitoes. Cedarwood atlas, cinnamon, patchouli and spearmint essential oils can be blended with those above to make a natural insect repellent that can be used to repel a wide range of biting, flying insects. Bees, wasps and hornets are by far the most difficult flying insects to deter, and most of the available products containing Deet or Permethrin are simply not effective against these tough guys any longer. Nonetheless, essential oils can offer some level of protection, but you should always keep a sharp eye out for this group of stingers. And a quick word of warning here; never use lavender essential oil to deter bees since they like to collect the pollen from lavender flowers, and the aroma will attract them. All of the essential oils listed in the sidebar are ‘safe’, it is a question of the concentration that is being used that is the important factor with safety. That said, if you intend to use only 1 essential oil, don’t use white thyme or peppermint since they can irritate the skin if the concentration is too high. If either of these is mixed with 2 other essential oils it shouldn’t be an issue, since they would be at a lower level. Use a concentration of no more than 2%, which is about 1 drop of essential oil to every 5mls of carrier lotion or oil. Flies will always buzz around where there is food, so when eating outdoors vaporise eucalyptus radiata, eucalyptus lemon, cedar atlas, clove bud, lemongrass, peppermint, spearmint or lemon essential oils. If you are eating outside at home on the patio or close to the house use an electric essential oil diffuser, if it’s not too breezy. If this is not possible just put a few drops of undiluted essential oils on a piece of tissue near the food to act as a deterrent. Use the same tip when having a picnic away from home. When eating outdoors in the late evening you can almost certainly expect a night raid from fluttering moths. Since they are attracted to the light from your table candles, you should place your diffusing weaponry around the light sources. Lemongrass, eucalyptus lemon and citrus essential oils seem to be the best for keeping moths at bay, but the anti-fly oils can also be an effective deterrent. Ants seem to get into absolutely everything, especially when you are trying to enjoy food outdoors. These relentless intruders aren’t too fond of peppermint essential oil, so prepare an aromatic offensive by adding 15 drops of peppermint to 25 mls of water in a trigger-spray. Shake the bottle vigorously and then spray a defensive line wherever you see an army of them crossing into your territory. Peppermint hydrosol is a ready-made weapon for this, plus you can use it on yourself to help stay cool whilst in the midst of battle too! Ants use their scent to follow each other and peppermint seems to confuse their otherwise formidable sense of smell. They usually won’t cross your aromatic defence lines, but if they do, just increase the concentration of peppermint oil or use it neat. Take care not to get the undiluted oil on your skin or in your eyes though. Beetles and spiders are not as intimidating as some of the airborne predators, but they’re still not much fun if you come face to face with one in your sherry trifle. Essential oils of white thyme, peppermint, eucalyptus globulus, and most of the lemon scented essential oils seem quite effective on all but the most determined six-legged invader. Sometimes actually wearing your aromatic armoury is the best defence in this particular battle. Mix a single essential oil (or up to four) in a Carrier Lotion Base, adding 1 drop of essential oil for every 5 mls of lotion, and apply it to your exposed body parts for a natural insect repellent. You can use a carrier oil instead of lotion, but remember it will leave your skin a little greasy. Since insect repellent essential oils are not as powerful as the chemical ones you will need to re-apply your blend every 3 hours or so for it to remain effective. You may need to experiment a little with your choice of essential oils to find what works best on the native species in your country. But wherever you are, insect repellent essential oils offer the best and safest form of tactical support to fight hostile invaders whilst you are enjoying the great outdoors. When an essential oil is located in the root, bark or leaves of a plant it is to defend against predators, whereas the essential oil found in flowers and fruit is produced to attract pollinating creatures. Research in several countries around the world confirms that certain essential oils not only repel insects, but also have contact and fumigant insecticidal actions against specific pests. Since they have been proven to be so effective in deterring a wide range of insects, natural crop protection sprays are now being developed on a commercial scale to replace those that we now know have a serious impact on wildlife and the environment. Quinessence Insect Repellent Lotion contains an expert blend of insect-repelling Citronella, Eucalyptus lemon and Cedar atlas essential oils. This gentle hypo-allergenic lotion is also enriched with moisturising oils and soothing botanicals to keep your skin in great condition in the summer sun.